Aaron McCleavy and Michaela Murphy. Photo by Roger Barone. BOTTOM LINE: A unique approach to spreading mental health awareness. Under: A New Musical takes on the challenge of voicing concerns about mental health care for college students. Set half in a psychiatric hospital, half at university, the story depicts the experiences of Serena (Michaela Murphy) as she is hospitalized and diagnosed with mental illness while a student at Yale. It also touches on her friends’ (James Lee, Jordan Schroeder, and Zina Ellis) struggles with mental health, though they remain untreated, and her budding friendship with Billy (Aaron McCleavy), a boy she meets while in treatment. Each character reaches some breaking point (typically conveyed through music), most notably in the song “A Lot to Swallow,” during which Serena and Billy begin medication regiments for their illnesses while fellow student Noah and Mark struggle with inner demons, succumbing to the pressures of being part of the Yale student body. 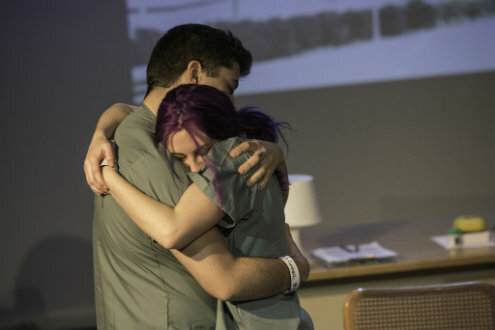 Sharing this critical look into who is labeled “insane” is a difficult task to take on—mental illnesses, especially within the young adult population, are rarely discussed, never mind brought to life through theater. Though an admirable try, there are a lot of loose ends within the story; it’s unclear at times what the characters experience, how they get to where they are, and what motives drive them to action. Additionally, the transitions between scenes are a bit long and abrupt, disrupting the flow of the piece. The music itself has a pop/rock feel, very appropriate to the musical’s tone. Songs begin quite naturally and appropriately in moments of heightened emotion, making the musical an effective tool to discuss heavy subject matter. The drive of the writers and artists, and Under's radical resonance, make this a show with a lot of promise.